You make vitamin D in Canada between the months of May and October. The best time for exposure is around midday, between 10am and 2pm, when the UV index is above 3 and your shadow is shorter than your height. The further you get from noon, the lower the amount of vitamin D you’ll make. The sun’s visible light may penetrate through glass, but UVB light will not therefore you will not make vitamin D.
Full body sun exposure at non-burning levels can create between 10,000-25,000 IU of vitamin D in your skin. You can never get too much vitamin D from the sun as your skin self regulates itself, whereas ingesting vitamin D does not have the same control. In addition, vitamin D that you make from the sun lasts twice as long in your body as vitamin D taken through supplements or food. Statistics Canada reports that Canadian vitamin D levels have dropped by 10% over the past six years. The root cause of this decrease is lower sunshine exposure. People are just not getting outside around midday in the summer and making vitamin D and when they are outside they are using sunscreen which if applied correctly prevents 95%+ of vitamin D production. Skin cancer is a concern and risk of sun exposure must be managed and balanced with the benefits from vitamin D and other photoproducts. Research has shown that people with higher sun exposure such as outdoor workers, who have 3-10 times the sun exposure as indoor workers, have a lower incidence of melanoma. The National Cancer Institute reports that melanoma risk is increased as a result of intermittent acute sun exposure leading to sunburn. 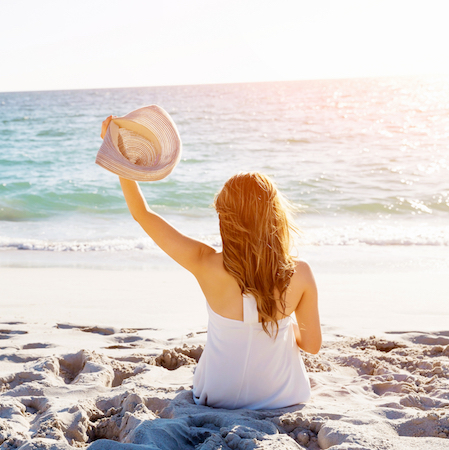 People who are a skin type 1, with white or very pale skin colour, red or blonde hair colour and who always burn and never tan, should severely limit their sun exposure. Know your own skin and skin type. Don’t burn. Never overexpose yourself. Expose more skin for a shorter period of time to generate more vitamin D while reducing your risk of overexposure.